World Flower -A is a level in World Flower in New Super Mario Bros. 2 that is unlocked by locating the secret exit in World Flower -1. The level takes place underground in an icy area. Mario begins on an unslippery platform above the ice. A Koopa Troopa can then be found on the ice, below two ? Blocks and a Brick Block, one of which contains a Super Leaf. After several small gaps, several Buzzy Beetles can be found on the ceiling. What follows is a large abyss that an ice platform crosses over. Several Buzzy Beetles and Koopa Troopas will fall from smaller ice platforms during the ride. Spike Tops will then begin to appear. At the end of the ride is the checkpoint. Another Super Leaf can be found in a ? Block after that. Several gaps from platform to platform appear next which have Spike Tops and Buzzy Beetles on them. In between the gaps are rectangular Ice Donut Lifts. Further on, several one-way gates appear, followed by another moving ice platform. Koopa Troopas, Buzzy Beetles and Spike Tops can be found along the ride. Several rectangular Ice Donut Lifts are also in place during the ride. At some points, these platformed will have to be ducked under or jumped over. On the platform below, the exit Warp Pipe can be found. Back outside, another moving ice platform spans an abyss. A single square ice platform can be found during the ride before the flagpole. Completing this level will unlock World Flower - and a green Toad House. Star Coin 1: The Star Coin is above an ice platform which is used by the first Spike Top to walk on. 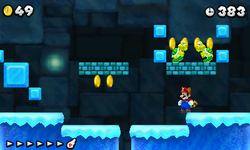 Star Coin 2: The second Star Coin is below the third ice platform after the checkpoint. A nearby Buzzy Beetle must be stomped and its shell must be tossed from the left to a Brick Block under the next platform so that the shell will bounce off the platform walls at the right positions into the Star Coin. Star Coin 3: The Star Coin is above the second square ice platform being used by two Spike Tops during the second ride. This page was last edited on March 13, 2019, at 02:47.